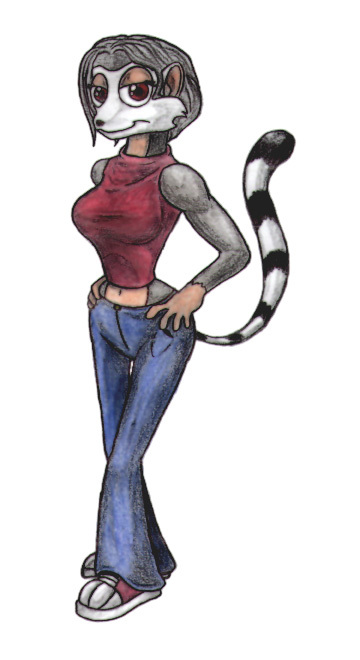 A female ring-tailed lemur. Katie was a straight 'A' student all through grade school and high school, and desires for a career in the sciences. Her plans are to get into palaeontology, and to specialize in both ceratopian and hadrosaur dinosaurs. Always keeping her mind on the future, she often finds it difficult to relate to her fellow students, who show more interest in partying rather than aspiring for greatness. Though practical, with both feet firmly on the ground, she sometimes daydreams about what her future will be like and would not finish many tasks if not for her overall determination to be the best at whatever she does. Although both of Katie's natural parents were ring-tailed lemurs, her mother and father separated when she was only three years old. She lived with her mother from that point on, her father never tried to contact her and Katie wouldn't have wanted it any other way. Her mother married a ruffed lemur named Samuel Jepson, who now teaches molecular biology at the University of Metazoa. Sexual Preferences: Heterosexual, with "other" well hidden inclinations.